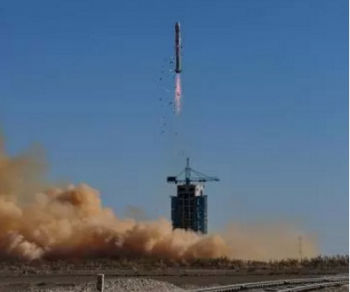 China has conducted the launch of the latest Tianhui-1 satellite, believed to be the third in the range following on from a previous launch in 2012. The launch of Tianhui-1C took place at 07:10 UTC, utilizing the Long March 2D (Chang Zheng-2D) rocket, lifting off from the Jiuquan Satellite Launch Center. Like the first two satellites, the first of which was launched on August 24th, 2010, the new satellites are being used for mapping using stereo-topographic techniques from orbit. The Tianhui-1 (Sky drawing) satellites – built by the Hangtian Dongfanghong Weixing Corporation and established by the China Aerospace Science and Technology Corporation and the Chinese Academy of Space Technology (CAST) – are equipped with a three-dimensional survey camera and a CCD camera with a ground resolution of 5 meters, spectral region of 0.51μm to 0.69μm, and with a camera angle of 25 degrees. A multi-spectrum camera – with a ground resolution of 10 meters, and spectral region of 0.43μm to 0.52μm, 0.52μm to 0.61μm, 0.61μm to 0.69μm, and 0.76μm to 0.90μm – was also be aboard. The cameras form an image of 60 kilometres wide. The satellites operate on a 500 km circular orbit and are equipped with two deployable solar panels for energy generation that is stored on onboard batteries. The Tianhui-1 satellites are part of the Ziyuan program that cover different civil and military earth observation as well as remote sensing programs. The Ziyuan-1 program is focused on Earth resources and looks to have two distinct military and civil branches (this one being operated together with Brazil). The satellites are operated jointly by the Center for Earth Operation and Digital Earth (CEODE) and the Brazilian INPE (Instituto Nacional de Pesquisas Espaciais National Institute of Space Research). The Ziyuan-2 program is understood to be used for aerial surveillance, operated by the People’s Liberation Army (PLA), while the Ziyuan-3 series will be used for stereo mapping (like the TH-1 Tianhui-1 mapping satellites that are operated by the PLA). 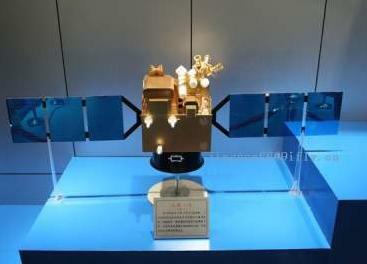 Ziyuan-3 satellites are operated by the State Bureau of Surveying and Mapping. There have also been indications that the development of Tianhui-1 program was merged with the Ziyuan-3 project planned for launch in 2011. The CZ-2D can launch a 3,500kg cargo in a 200 km circular orbit. Its first stage is the same of the CZ-4 Chang Zheng-4. The second stage is based on CZ-4 second stage with an improved equipment bay. Lift-off mass is 232,250 kg, total length 41,056 meters, diameter 3.35 meters and fairing length 6.983 meters. The first stage has a 27.910 meter length with a 3.35 meter diameter, consuming 183,200 kg of N2O4/UDMH (launch mass of the first stage is 192,700 kg). Equipped with a YF-21C engine capable of a ground thrust of 2,961.6 kN and a ground specific impulse of 2,550 m/s. Burn time is 170 seconds. The CZ-2D can utilize two types of payload fairing, depending on the cargo. Type A fairing has a 2.90 meters diameter (total launch vehicle length is 37.728 meters) and Type B fairing with a diameter of 3.35 meters (total launch vehicle length is 41.056 meters). Presently, only the LC-43 launch complex, also known by South Launch Site (SLS) is in use. This launch complex is equipped with two launch pads: 921 and 603. Launch pad 921 is used for the manned program for the launch of the CZ-2F Chang Zheng-2F launch vehicle (Shenzhou and Tiangong). The 603 launch pad is used for unmanned orbital launches by the CZ-2C Chang Zheng-2C, CZ-2D Chang Zheng-2D and CZ-4C Chang Zheng-2C launch vehicles. The first orbital launch took place on April 24, 1970 when a Chang Zheng-1 rocket launched the first Chinese satellite, the Dong Fang Hong-1 (04382 1970-034A).